My Mail section has disappeared, how can I get it back? If any of the main left-side sections is missing, whether it's Mail, Calendar, Tasks or Contacts your data is definitely not gone. It just means you accidentally hid the section. You can make it appear again easily. 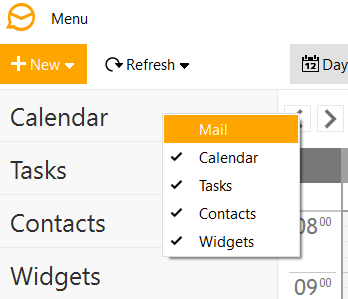 Just right-click any of the other items in the same menu (for example Calendar) and a drop-down menu with all options will appear. The missing section will not have a checkmark next to its name. Click it to check it and make it appear again.